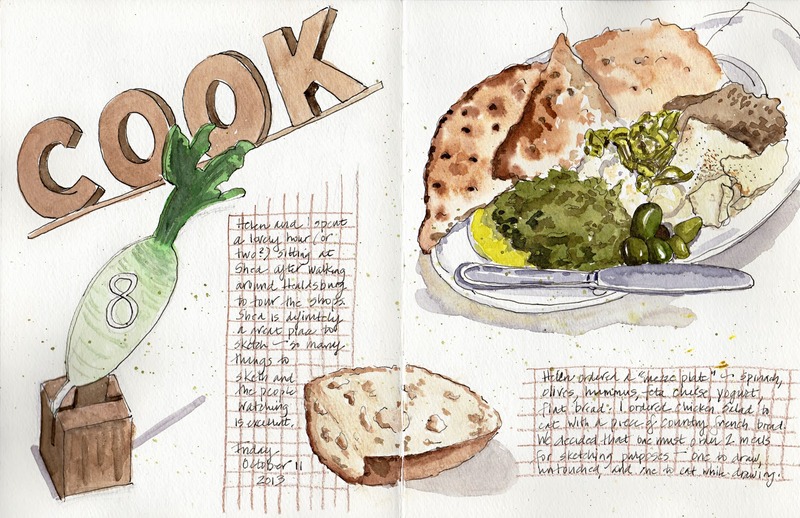 You will recognize this page in my sketchbook from your recent visit and our trip to SHED in Healdsburg. What a lovely visit that was -- thank you again for coming all of this way. You are an easy friend to entertain. We like so many of the same things that we do not have difficulty coming up with options to fill our time, do we? In any event, I finished my page after you left and thought you'd like to see it. Will you add your sketch to this post? It has taken me a while but finally here is my page. You seem to have yours at a better size and you now, its so long since I blogged I have almost forgotten how to do it, so excuse the modest picture! I too really enjoyed our time together and we certainly need to do it again. Not least so you can explain again how I can stop my watercolours looking so inspid!